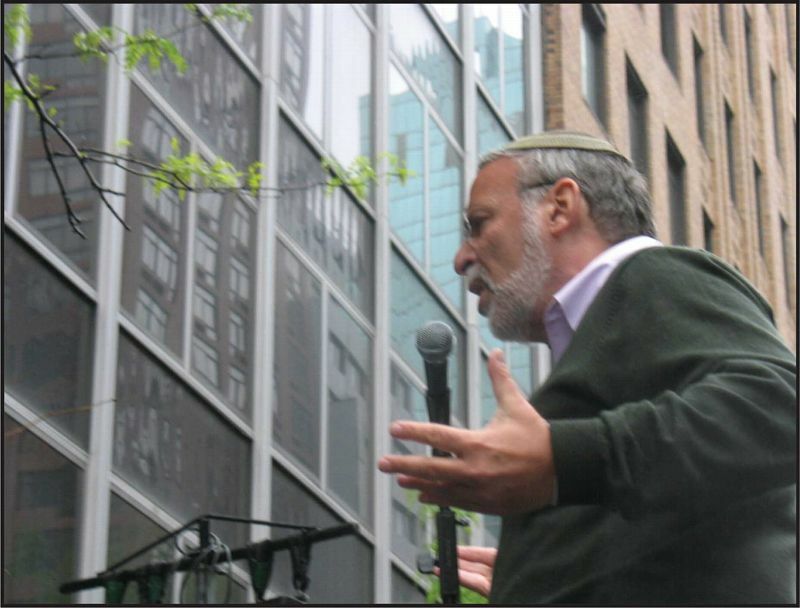 Rabbi Avi Weiss addresses a rally for Israel in NYC in April 2010. It’s painful to have one’s rabbinic credentials challenged by the Chief Rabbinate of Israel . But that’s exactly what’s happened to me. In truth, it’s much more hurtful to the many people I’ve been honored to serve over the years. In recent days, I have been informed that letters I’ve written attesting to the Jewishness and personal status of congregants have been rejected by the office of the Chief Rabbinate. I’m not the only Orthodox rabbi to have his letters rejected – there are others. I have chosen to go public because the issue is not about me, it’s about a Chief Rabbinate whose power has gone to its head. As Israel ’s appointed rabbinate, it is accountable to no one but itself. Nor could the Chief Rabbinate have denied letters from me or other rabbis without input from select rabbis here in America who, I believe, are whispering into the Chief Rabbinate’s ears. For me, they’ll whisper one thing, for another they will find some other reason to cast aspersions. This is an intolerable situation. It not only undercuts the authority of local rabbis who are in the best position to attest to the religious identity of those living in their community, but wreaks havoc for constituents whom these rabbis serve. Penning these harsh words about Israel ’s Chief Rabbinate is not easy for me. I grew up in a home that venerated the Chief Rabbinate. After my parents made aliya, my father served as rabbi of Shikun Vatikin in the outskirts of Natanya , Israel . There he worked with Rabbi Yisrael Meir Lau, then Chief Rabbi of Natanya who went on to become Israeli’s Ashkenazic Chief Rabbi. Over the years I’ve met with many chief rabbis. I found them individually to be not only learned but caring. But for some time, I’ve come to the conclusion that the Chief Rabbinate as an institution just doesn’t work. Built into the very fabric of the institution is the principle of kefiyah, rabbis overlording the citizenry, forcing their religious dictates down their throats. Indeed, the Chief Rabbinate has become a subject of scorn amongst the grassroots public in Israel . Spiritual striving and religious growth can only be nourished in a spirit of openness. For this reason, Israel as a State should give equal opportunities to the Conservative and Reform movements. Their rabbis should be able to conduct weddings and conversions. For that matter, civil weddings should also be recognized by the State. As in America , it should be left to the general public – if they wish, in consultation with their local rabbis – to decide whether to accept or reject these conversions and wedding ceremonies. Such an open attitude is not only important for non-Orthodox Jewry, but for Orthodoxy as well. When Orthodoxy is presented as the only option, when it’s forced upon people, it turns people off. A spirit of openness will make Orthodoxy more attractive. A related reason that the Chief Rabbinate does not work is that it involves centralization of rabbinic power, that is, rabbinic power left in the hands of a select few who dictate religious policy throughout the country. I predicted then that this would be but the first step towards further centralization. That it would not be long before a centralized rabbinic body fully usurps the authority of local rabbis, deciding which select few can do marriages. And only this body will be able to sign off on letters attesting to the Jewishness or the personal status of individuals from across the country. Is this the type of religious authority we want here in America ? The time has come for the government of Israel – its Prime Minister and Knesset – to pronounce in clear terms that the Chief Rabbinate will no longer have a monopoly on religious dictates of the State. This will present challenges. But these challenges pale in comparison to a coercive and centralized system which is vulnerable to abuse. As the motto goes, power corrupts, absolute power corrupts absolutely. It’s only in the spirit of openness that Israel as a Jewish democracy will thrive. It’s in that framework that Israel ’s citizenry will be able to reach higher heights – spiritually and religiously. Rabbi Avi Weiss is senior rabbi of the Hebrew Institute of Riverdale and Founder of Yeshivat Chovevei Torah and Yeshivat Maharat. He is also a co-founder of the International Rabbinic Fellowship (IRF). The opinions presented here are his alone.